Last week, we told you that Meyer Turku began production of Carnival's X1 by beginning the steel cutting. This ship is going to be part of the ramp-up of production at Meyer's Turku facility. Costa Luminosa really came to the rescue of the crew of a fish carrier in the early morning hours of Tuesday morning in the Aegean Sea, saving 11 lives. Details appeared in November 21 issue of Cruise News Daily. You probably won't see anything like it anywhere else, especially on any other cruise ship, but Symphony of the Seas has a show that is getting rave reviews from passengers who saw it in Europe, and now it is here for US audiences. “Flight: Dare to Dream” takes the audience through the history of flight - in reverse order - by starting with landing on Mars and working back to the International Space Station, landing on the moon, and eventually back to the Wright Brothers first flight. This behind-the-scenes video gives you a peek at how the show was produced and some of its highlights. Details appeared in the November 20 issue of Cruise News Daily. Norwegian Jade is alongside in San Juan tonight with an unspecified mechanical issue that caused Norwegian Cruise Line to cancel the 10-day cruise after just two days. The complete story appeared in the November 19 edition of Cruise News Daily. Celebrity Edge arrived at Port Everglades on Sunday, with 1,400 crew members aboard, directly from Saint-Nazaire, France and the Chantiers de l'Atlantique shipyard, 4000 miles away. During the 15-day crossing, with only the crew, the ship made calls in the Azores and the Bahamas. Details appeared in the November 19 issue of Cruise News Daily. With the APEC summit wrapping up, the Carnival Australia ships that have been providing accommodation for the delegates in Port Moresby, Papua New Guinea, the ships began departing today. As the first departed, Pacific Explorer and Pacific Jewel and Princess Cruises' Sea Princess each sounded their whistles seven times to achieve the equivalent of a 21-gun salute that echoed across the city. 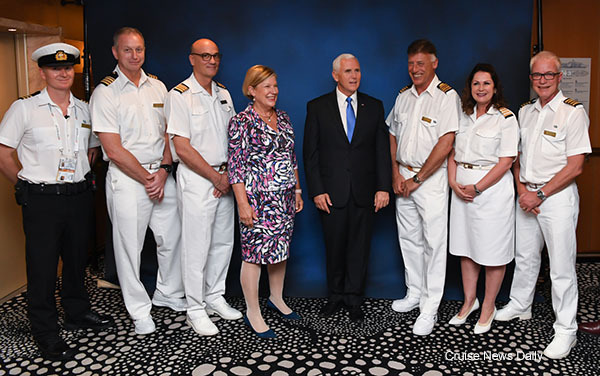 Details appeared in the November 19 edition of Cruise News Daily. 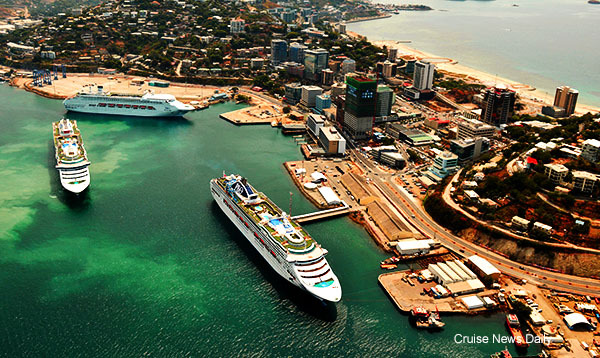 Pacific Explorer and Pacific Jewel and Sea Princess in Port Moresby. Photos courtesy of Carnival Australia. All rights reserved. May not be copied or used without express permission.